Associations have recognized the value of a web-based continuing education program. Not only do these programs provide a great member benefit, they also create a destination portal within an association’s website. 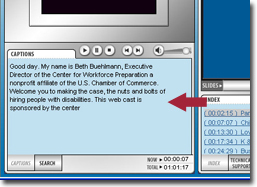 The use of webcasting to enhance these programs has grown over the past several years as a way to provide a more compelling learning experience for users. And sponsors seek like to demonstrate their support for their industry through these well attended programs. Recognized by our customers as the most compelling solution in the webcasting marketplace, our extensive suite of webcasting features offers the ability to supplement the user’s learning environment. Our reports offer valuable information about the user’s experience providing valuable information about who watched, for how long, and even how many times they watched before they took and passed a test. Our auto-graded tests enable great efficiencies in managing any continuing education program and can produce auto-generated certificates. 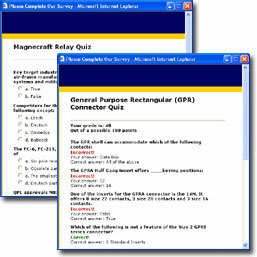 Detailed test reports provide summary and detailed data for each user. Synchronized transcription enhances the learning environment and is supplemented by keyword search. This unique feature enables users to index by keyword directly to points in the presentation to enhance the learning experience. As new regulations on sponsored CME programs force organizations to re-evaluate funding sources, we invite you to take advantage of our sponsorship program, which funds distance learning multimedia programs by matching associations with interested companies. Working with our sponsorship sales partner, we identify unique sources of funding and implement this all-in-one technology solution and that guarantees a share of the sponsorship fee for our clients.